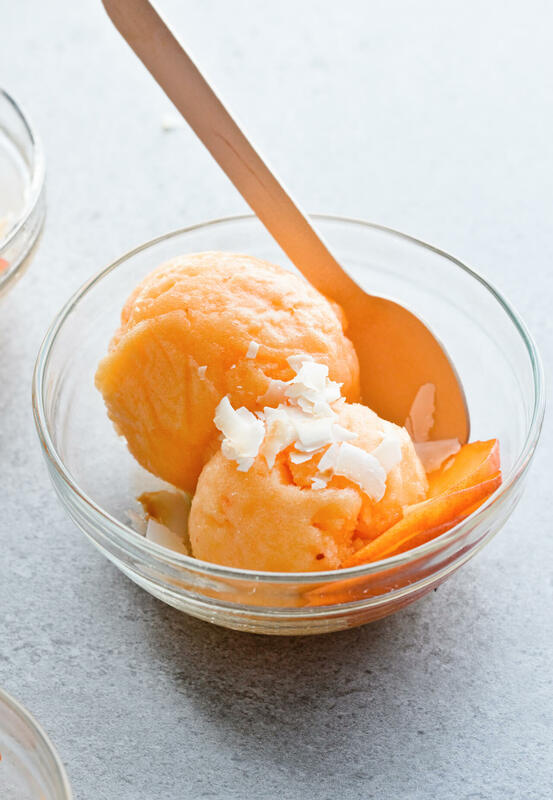 All the flavors of the summer are neatly packed in this Coconut nectarine peach sorbet. Can you believe we only have a week of August left? I’m actually really excited for September and Fall as you all know, but I have to say that August has been really beautiful so far. Way better than July, generally less hot and just nicer, with fresher sunsets, which are my fave. I hope you’re all still enjoying ice cream after all these months. I am an ice cream addict, but I have to say that I’ve definitely been having less of it compared to the beginning of summer. Instead, I’ve been stuffing my face with peaches and nectarines all this time, because how could I not? I wish they were this good all year, but they’re not, so I’m taking advantage. I may be having less ice cream, but of course I’m not giving it up completely. 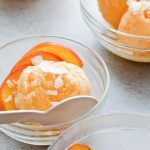 And if you’re looking for a cross between ice cream and fresh fruit, then I think this coconut nectarine peach sorbet hits the spot. 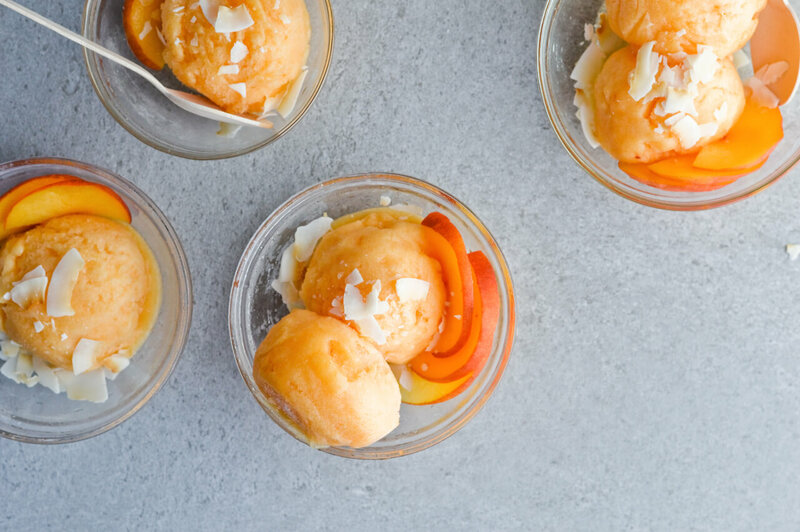 As a rule, sorbet has no dairy or eggs, it’s basically just frozen fruit. Does this even count as dessert? Okay, you make it with some sugar and water too, but that’s pretty much it! So in the end you can almost feel like you’re having ice cream, but it’s less calorie-laden. The best sorbet in my opinion comes from amazing fruit. 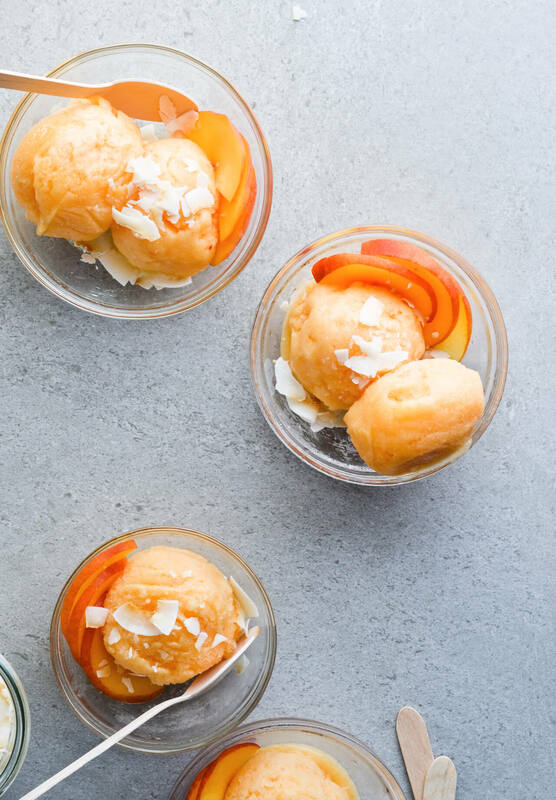 If you use really juicy, ripe peaches and nectarines you get the best possible flavor. And they’re naturally sweet, so you can use less sugar. It’s a win-win scenario. And instead of simple water, I prefer to use coconut water. It adds that light hint of coconut, which I adore. 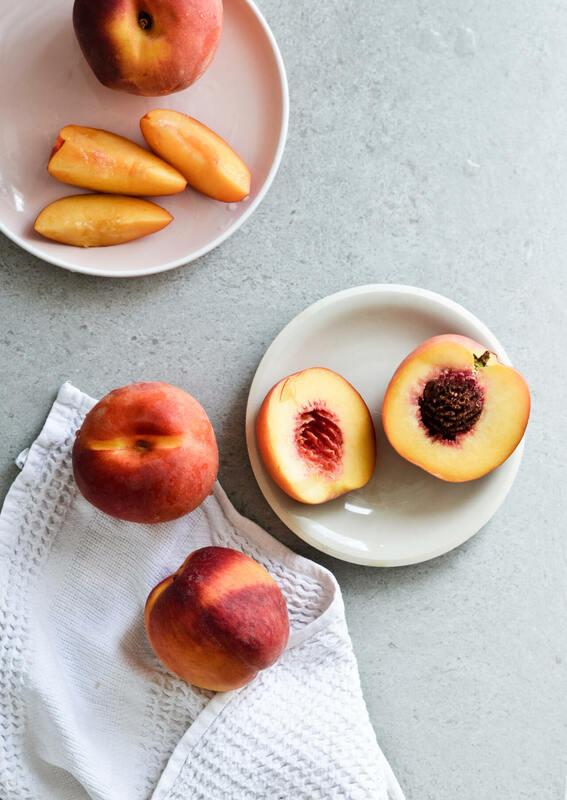 The reason why I use both nectarines and peaches is that they’re basically the same, so they work well together, but they are different enough that you get two layers of flavor instead of just one. For the longest time I preferred nectarines over peaches, but now I think I love them both equally. Or maybe it depends on the day, because there are days when I just prefer nectarines, but then I start missing peaches and go back to that. 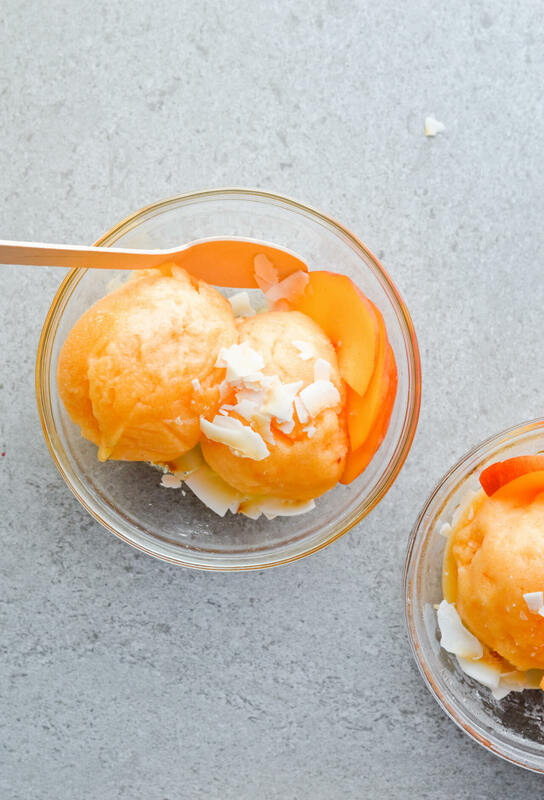 This coconut nectarine peach sorbet is truly the perfect summer treat. It’s cold and refreshing, slightly sweet and just so fruity. I serve it with coconut chips, to add more of that coconut flavor and some crunch. And I always add either a sliced peach or nectarine, because fresh, soft fruit is a nice contrast to the icy sorbet. Recipe makes about 9 scoops of sorbet. Freeze peaches and nectarines until firm, or even overnight. 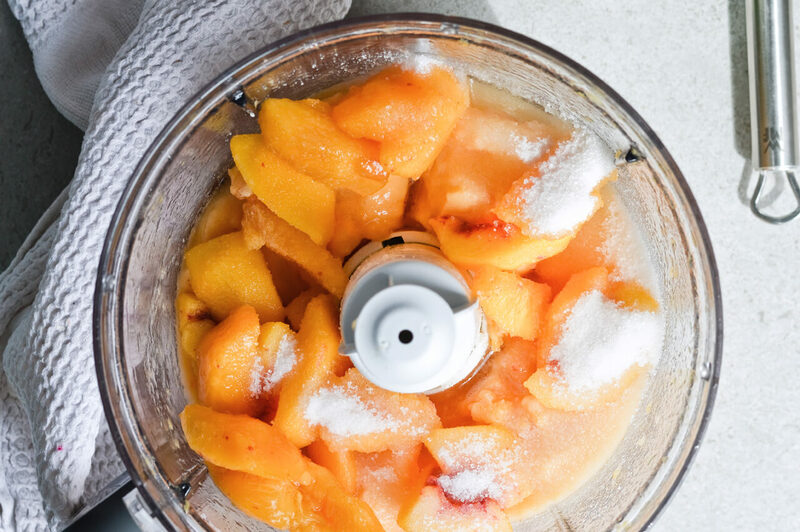 Transfer fruit to a food processor along with the coconut water, sugar, lemon juice and salt. 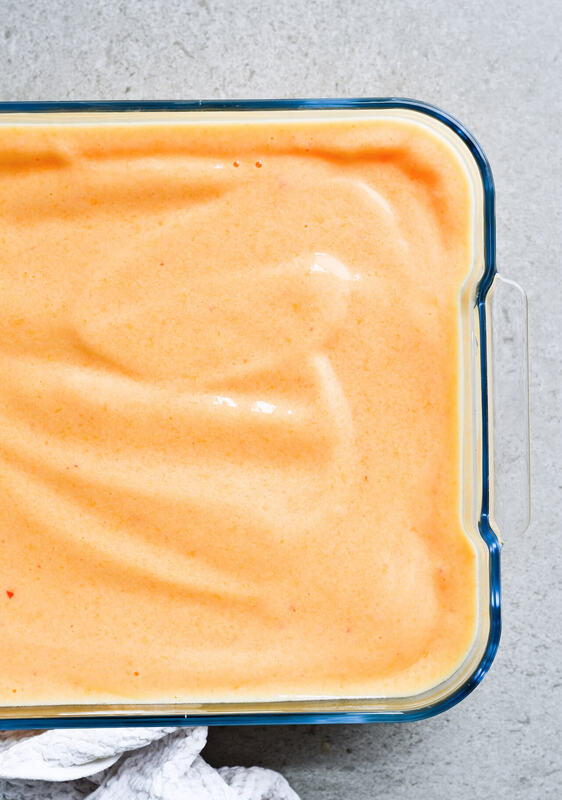 Blend on high until the mixture is completely smooth. It should be thick, but still easy to stir. Taste to see if you need more sugar. Transfer mixture to a loaf pan or glass baking dish (I used a 2-quart Pyrex dish). Cover with plastic wrap and aluminum foil, freeze until solid – for about 6 hours or overnight. The sorbet keeps for 3 days. When serving, let it sit at room for a few minutes before making scoops, it’s easier to get them out that way. 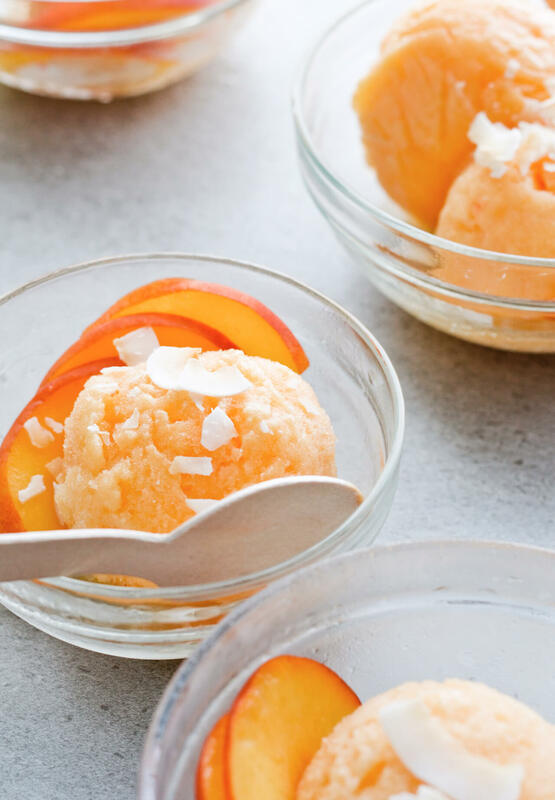 Serve sorbet with slices of peaches or nectarines and coconut chips sprinkled on top. 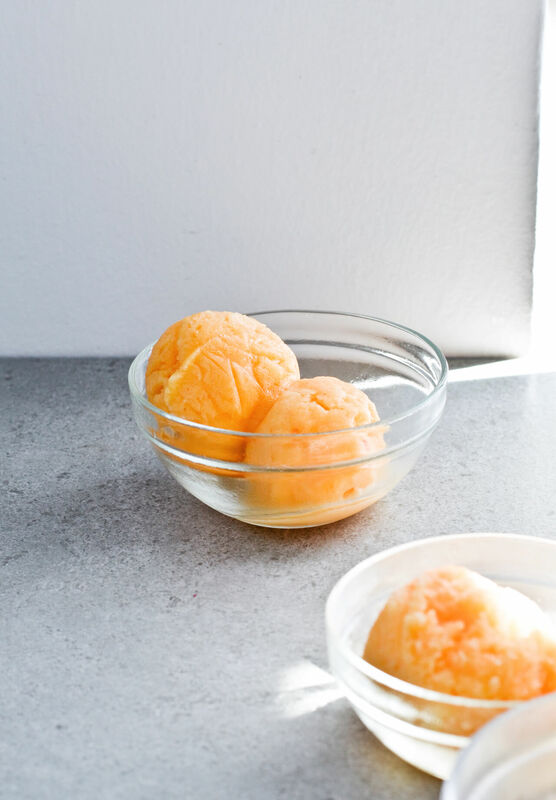 Try to use fruit that’s really ripe as that will give the most flavor to this sorbet. Also, the riper the fruit the less sugar you need when making this. Recipe adapted loosely from Martha Stewart. These photos are beautiful! And I love the sound of that sorbet. Perfect to celebrate the end of summer! Thank you, Madeline! It definitely is.